Several endoscopic ultrasound-specific stents have become available. Some of these stents claim lumen-apposing properties but objective data measuring such properties are not available. The aim of this study was to measure the lumen-apposing force (LAF) of these stents and to define what properties should lumen-apposing stents possess. Four types of anastomoses were performed with the stents including cholecystoduodenal, cholecysto-gastric, gastro-gastric and gastro-jejunal and compared with a hand-sewn (HS) equivalent of the anastomosis. 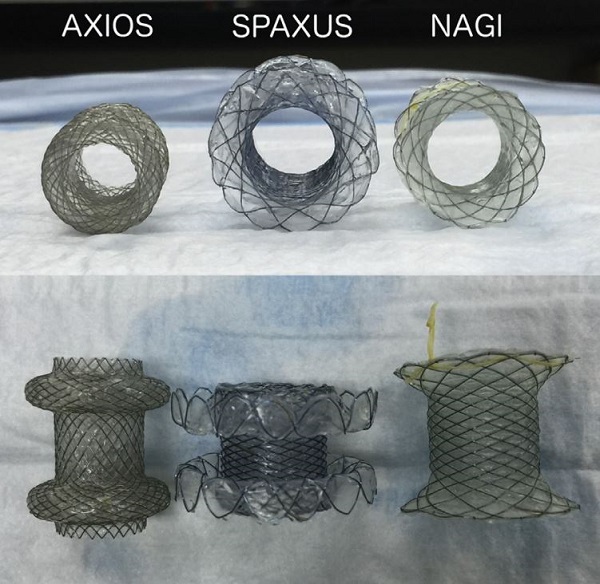 The LAF of 3 EUS specific metallic stents (stents N, A, and S) were then compared in a controlled ex-vivo setting. Figure 1. The EUS-specific stents. EUS-specific anastomosis is increasing performed for not adherent organs using lumen-apposing stents. The integrity of the anastomosis is entirely dependent on the LAF of the stents. If the LAF is inadequate, it may result in leak or stent migration resulting in catastrophic outcomes. This study provides important basic data on the LAF supporting the performance anastomosis using stents with high LAF’s. Stents A and S had a higher LAF. The use of these stents should be considered when performing EUS-guided transmural luminal anastomoses in non-adherent organs. Further studies are required to confirm the clinical efficacy of these EUS-specific stents.